2-8 years (like all the patterns in the book), I made size 8 for my 6 year old daughter who wears 8 in retail (French sizing). It called for a little over a yard of fabric in 55″ width. Hum well considering this is a very easy pattern with only 5 pieces (front, back, front facing, back facing and lower band) I found them fuzzy. I made several garments using the patterns in the book and I have to say that the instructions are not clear ! No illustrated instructions, no numbering and the bad layout (one block of text, no spacing) doesn’t make it easy to read. A classic for little girls, one with which you can express your creativity (mine is limited). ROBERT KAUFMAN “COOL CORDS” Skulls Slipper and chocolate brown cotton for facing and lower part of the dress. I didn’t add the lower ruffled band as a result the dress was knee length. Which was perfect for my daughter. But I also didn’t have enough fabric (considering the ROBERT KAUFMAN fabric is a one way design and only 44″ wide) to cut the front and back pieces. so I added a contrasting fabric (chocolate brown cotton) on the lower part. I’ve already made this dress 3 times (one in denim and on in fleece see pic below) and I plan to make several for this summer in lightweight cotton. Yes I would recommend considering that you get this in a book with other basic patterns. But I guess you could find many similar A line dresses from other pattern companies… with better instructions. This is a perfect blank canvas for creating many variations. I’ts very versatile. 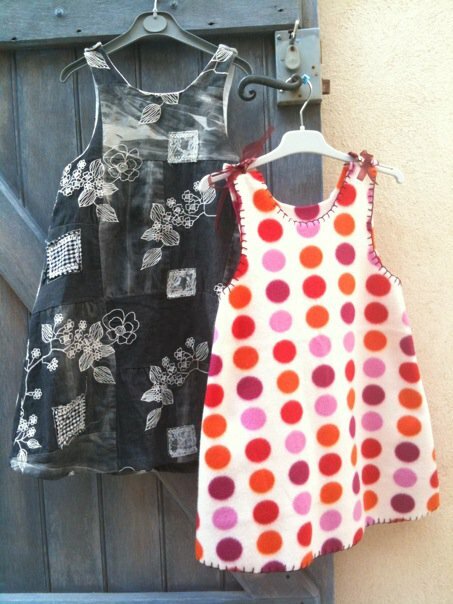 Depending on the fabric you use you could make dresses for any season. Plus it’s quick and easy ! 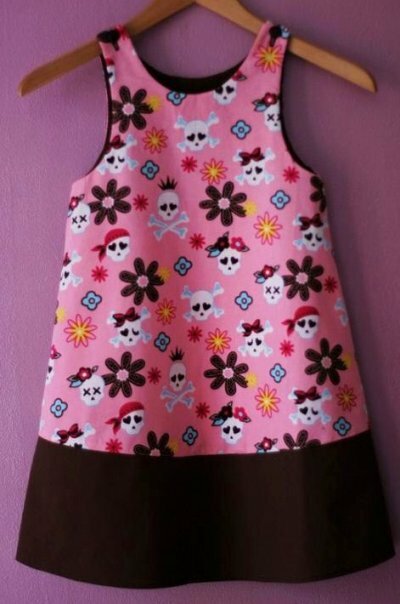 This entry was posted in Blog, Children Clothes, Sewing Projects and tagged Citronille by Véro. Bookmark the permalink.